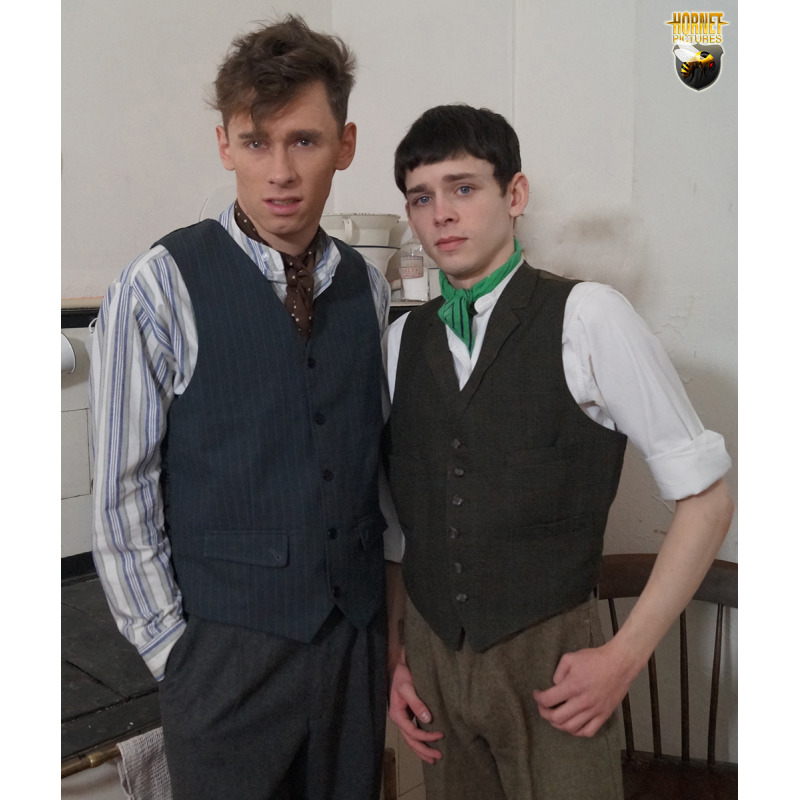 First to incur the wrath of their officer is Tommy Bruce (Xander Hollister and Jack Francis (Tom Nuttall) Rather than getting along quickly with their ablutions the two decide to engage in an intimate session together. Caught by Mr Shaw (Johan Volny) he takes action there and then and gives both miscreants and good spanking. As they want to indulge in explicit acts while in the House of Correction he decides to illustrate to them that with pleasure there is often pain! It’s very hard to pleasure your mate when your backside is on fire from the pounding palm of a fit young prison warder. It all very well laying it on but the warder wants more. Now he’s turned on to the matter in hand and its time to end the punishment proper. Down comes the twisted rattan carpet beater an ideal instrument to whack a wayward boy’s bare bottom. Now being serviced by one lads he gives the other something to think about. The stinging beater cracks loudly in to the other lads already well spanked bare bottom. It must be catching as over in the workshop where two lads are cleaning up more indecent acts are brewing. John Kelly (Aaron Alton) and Henry Osborne will face the governor Colonel Lee. He sends them straight off to their cell block warder Mr Stoddard. Now both over the knee of the Governor and Mr Stoddard the two are spanked red raw in tandem. The governor leaves instructing Mr Stoddard to administer the birch to each of the lad’s bare bottoms. This warder too sees his chance, who is ever going to know, the birch can stimulate more than just a well-rounded bare backside. First to feel the burning twigs lash in to his backside is John Kelly while on the other end young muscular Henry Osborne is servicing Mr Stoddard as he lays on the freshly soaked rods. The strokes build up scorching Kelly’s bare bottom leading all to a climax but not before the situation is revered and it’s Osborne who is on the receiving end. The site of his whipped bottom bucking and arching as the birch bites home brings the young warder to a quick conclusion. It might have ended there but inmate Osborne who’s buttocks are still burning the day after feels they had a raw deal in more ways than one and Mr Stoddard finds himself informed upon. The Governor feels he has to do something and lets the young officer choose between dismissal or a dose of corporal punishment to rectify the situation. Warder Stoddard although a fit muscular young chap goes for the hiding. The Governors assistant Mr Lindsay will lay on the punishment a good spanking no less and a birching whilst over the birching pony normally reserved to deal with the very young charges he is supposed to instil a moral sense in to. Now the tables have really turned all down to the power of persuasion!